Seek out a stimulating environment. Spend more time with friends or your grandchildren. Considering moving to a retirement community where a rich social life will be more easily available, with plenty of neighbors and regular activities. Research shows http://science.howstuffworks.com/life/inside-the-mind/human-brain/human-memory4.htm that “In our later years, a stimulating environment encourages the growth of dendrites,” a part of brain cells that help the cells communicate with one another, “while a dull environment impedes” dendrite growth. Take care of your body. Eat more fruits and vegetables, reduce sodium and carbs, and embrace freshly prepared meals over processed, fast foods. You want to maximize your nutrition for the same reason you encourage kids to eat right—growing bodies need the right fuel to regenerate new tissue, from your muscles to your brain cells. 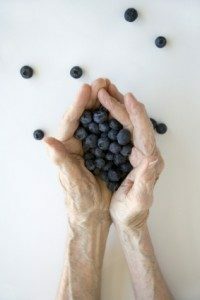 Eating right will help keep you young. Encourage yourself to relax. If you’re retired, you’ve already spent years working, chasing kids, maintaining your marriage, and keeping house. Isn’t it time to reduce your stress load a little? Make time for the things you enjoy, sign up for a yoga class, spend mornings or afternoons in nature, or start meditating. Anything you can do to reduce stress will reduce distractions that lower your mental function. Challenge yourself. This doesn’t contradict that last point—challenges can be a positive kind of stress like exercise. Take on a project like a new language, a woodworking plan, or simply finishing the weekly crosswords. Pushing your mind to complete new feats can be fun, entertaining AND help you keep your memory strong. Eliminate distractions. Find new ways to get organized by reducing clutter in your living space, setting up a paper or electronic calendar, making to-do-lists, and training yourself not to multi-task. Anything you can do to keep yourself focused on one thing at a time until that task is complete, and to help yourself anticipate what’s coming up next will help you commit events and procedures to memory.